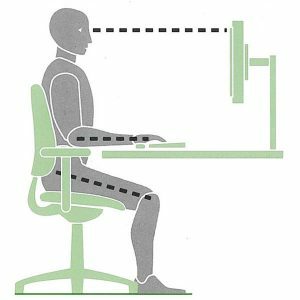 An ergonomic workplace assists with the comfort and productivity for an office worker. The first part in setting up a workstation is the setup of the chair. A lot of people have now invested in ergonomic office chairs. But no matter how much you invest in a chair, you will still experience muscle pains and aches if it is not set up properly. Here is a short guide to help you how to set up your chair for correct support. 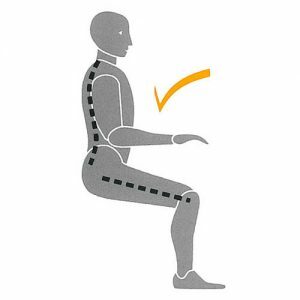 Adjust the seat height so that your hips are higher than your knees. This allows opening your hips and provides blood circulation to the legs and feet and reduce muscle cramping. Make sure both feet are firmly on the ground. This helps provide a stable structure, coordinate posture and reduce fatigue. A footrest is needed if the feet cannot reach the ground. Do not lower the chair to suit the desk height. Seat depth is needed for some to accommodate the thigh length and enables to sit back and gain support from the backrest. Always leave a gap between the front of the seat and the back of the knee. 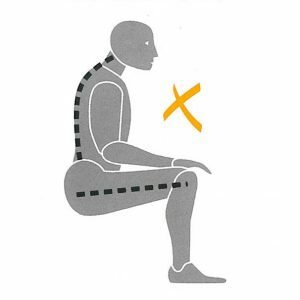 A seat tilt rotates the pelvis forward, which encourages the spine into an upright posture. Adjust the height of the armrests so that the elbows are supported but still maintain relaxed shoulders. Some armrests allow depth, width and angle adjustments. If possible, adjust the backrest so that the small of the back is supported. - Keep head balanced in line with the vertebral and neck muscle relaxed. - Sit with an open posture with chest leading and shoulders back to correct balance between head, shoulders and neck. - Take mini-breaks on a regular basis. Back2 have highly trained DSE assessors with extensive product knowledge to fully guide and assist you in adjusting your chair and making your workstation ergonomic. We stock a range of ergonomic office chairs that are suitable for users of all shape and sizes that provide many benefits. If you need more assistance or need help with evaluating your workplace, please contact us on 0207 935 0351 or fill in the online form here. Posted in on 28th January 2019 by Back2.